Dedicate the 1st (Mon) to wine at some of the top wineries in the area. 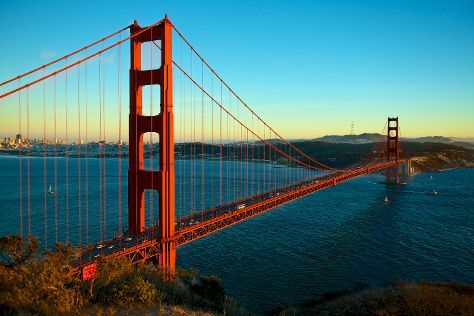 There's much more to do: step off the mainland to explore Alcatraz Island, snap pictures at Golden Gate Bridge, stroll through Crissy Field, and get a taste of the local shopping with Ferry Building Marketplace. Toronto, Canada to San Francisco is an approximately 8.5-hour flight. You can also drive; or take a bus. Due to the time zone difference, you'll gain 3 hours traveling from Toronto to San Francisco. Expect a bit warmer temperatures when traveling from Toronto in December; daily highs in San Francisco reach 17°C and lows reach 8°C. Finish your sightseeing early on the 3rd (Wed) to allow enough time to drive to Big Sur. Start off your visit on the 4th (Thu): kick back and relax at Pfeiffer State Beach, admire the sheer force of McWay Falls, then stroll through Julia Pfeiffer Burns State Park, and finally take in the views from Bixby Bridge. Traveling by car from San Francisco to Big Sur takes 3 hours. Alternatively, you can do a combination of train and taxi; or do a combination of flight and bus. In January, plan for daily highs up to 18°C, and evening lows to 7°C. Finish your sightseeing early on the 4th (Thu) so you can travel back home.